All lean-to kits on sale now! Call 1-800-665-2124 today for your discounted pricing and free quote. The Pacific Lean-to with curved double glass is a home attached lean to greenhouse kit designed to attach to an existing wall and is also designed to offer the maximum natural light for year-round greenhouse gardening. The home attached lean-to with double glass offers beauty, durability and maximizes heat efficiency. 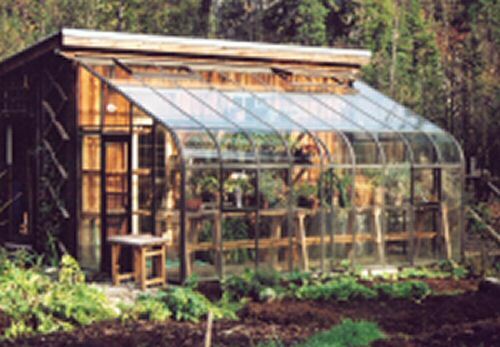 This quality home attached lean to greenhouse kit is an architectural delight and is sure to create a stunning focal point in any garden setting. This double glass lean-to is built to withstand harsh weather conditions, the durable aluminum frame comes with an attractive enamel paint finish. Large automatic roof vents provide air circulation and the double glass storefront door comes with a key lock and can be placed on either gable end. Or downgrade to a standard storm door with a twinwall polycarbonate insert panel for added insulation. Several door options available. The Pacific lean-to withstands wind load of 90 mph and snow load of 30 pounds per square foot. Should you require additional loading requirements, additional trussing can be added. Crated and Not in Cardboard Boxes!